Ending hunger in our lifetime might seem like a bold feat but for the organizers behind ‘Rise Against Hunger’ taking a stab at it is a calling. Formerly known as ‘Stop Hunger Now’ the rebranded nonprofit will give Annual Conference attendees the opportunity to help package thousands of meals to be shipped to the world’s most vulnerable. 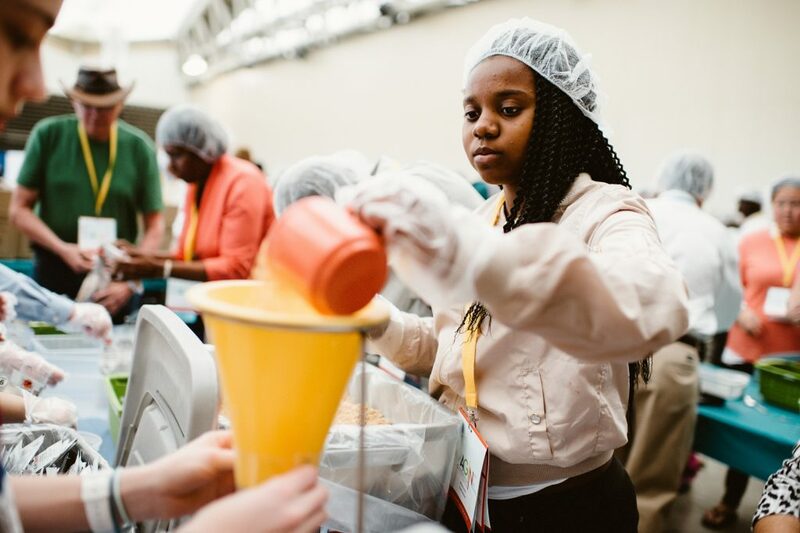 Last year, Annual Conference participants packaged 30,000 meals in a little over an hour, providing life-changing aid by creating a global commitment to mobilize necessary resources. On Monday, May 22 at 3:45 p.m. at the Wildwoods Convention Center in Wildwood, Annual Conference attendees will be joining forces with ‘Rise Against Hunger’ as well as local churches, groups, and individuals from the Wildwood and Cape May County community to systematically package meals together to help feed thousands. For the fifth year in a row, at least 100 participants from GNJ have come together to prepare 30,000 meals. The Food and Agriculture Organization of the United Nations 2016 statistics indicate 792.5 million people in the world don’t get the food they need to live a healthy life. The World Food Programme states that 66 million primary school-age children attend classes hungry across the developing world. In 1998, Rev. Ray Buchanan, a United Methodist minister, envisioned a world without hunger and founded the organization. According to Rise Against Hunger’s website, the organization’s approach to ending hunger centers on “mobilizing a global network of hunger champions.” Meal packaging volunteers produce millions of nutritious meals annually that are then distributed to partners in countries around the world who are best able to address the causes and effects of hunger based on their local presence and expertise. Through Rise Against Hunger’s monitoring and evaluation process, the organization ensures the meals distributed by partnering countries are used as a tool to change lives by promoting education, improving students’ health and nutrition, addressing gender inequalities, stimulating economic growth and fighting child labor. Last year, GNJ’s 30,000 packaged meals were shipped in a container totaling 278,208 meals from the organization’s Philadelphia warehouse. The meals went on to impact thousands across the world. GNJ is proud to partner with an organization that recognizes ending hunger is more than just feeding people but also expanding hunger-fighting programs beyond meal packaging and distribution to innovative, regenerative mission and education. “We are able to reach so many people in the two hours that we come together for this missional activity,” said Williams. Those who are not attending Annual Conference are also invited to take part in the meal-packaging event, which welcomes youth involvement.